Have you ever been to a tailgating party? They're usually celebrated before, during or after a sports game (either outside your home or in). Have you ever been to one where you didn't need to bring anything? Well, THIS is that kind of party. All you need to do is pull up a comfy chair, grab a little something warm to drink, and start reading. 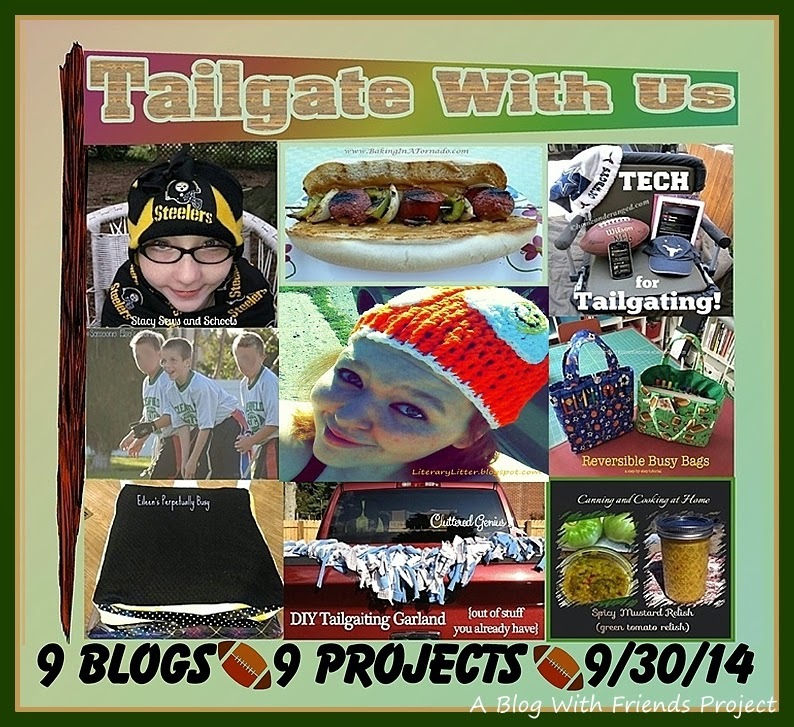 Karen@ Baking in a Tornado came up with a way for a group of bloggers to throw a new kind of "Virtual Tailgating" celebration and it's all for you! Each blogger up in that beautiful Brady Bunch-looking collage (9 of us all together) has prepared a 'lil "Tailgating Awesomeness" for you. It may be delicious, adorable, informative or comfortable. You'll find each of the links to these great projects at the end of this post. 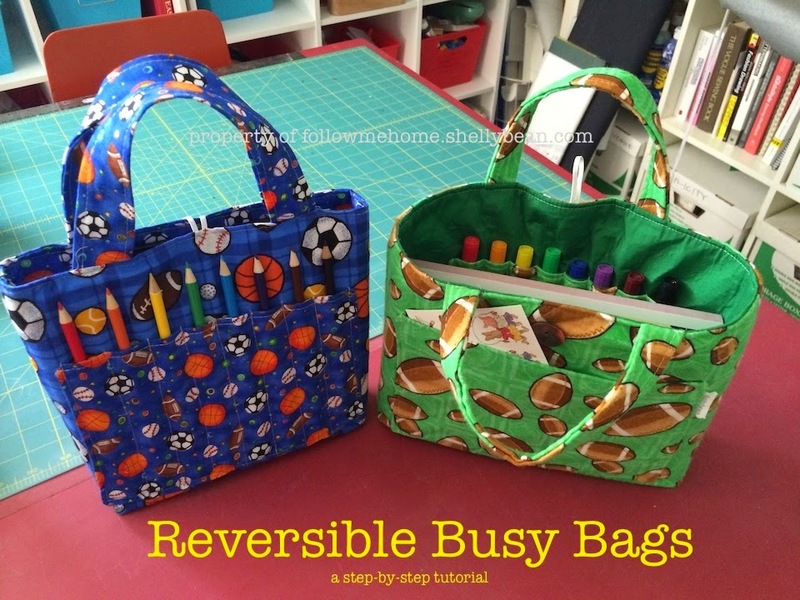 First up, though, is my tutorial for Reversible Busy Bags. 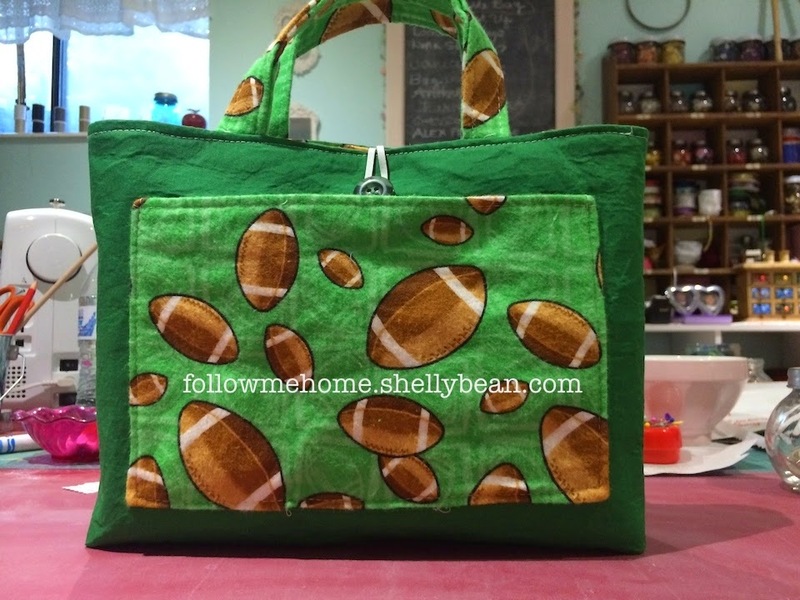 These are small carry-alls that your little one can bring to a game or any event. You can fill them with art supplies, treats, or books. Make them smaller for tots or bigger for you. Once you get the hang of making them, you may even want to create some for gifts (think Halloween treat bags!) They are my design. So please, don't sell them without my written permission. Want to learn to make one? Follow my photo tutorial! It's a bit lengthy, but easy to follow. Need to come back when you have more time? Bookmark the link up there in your address bar. Want to order one instead? 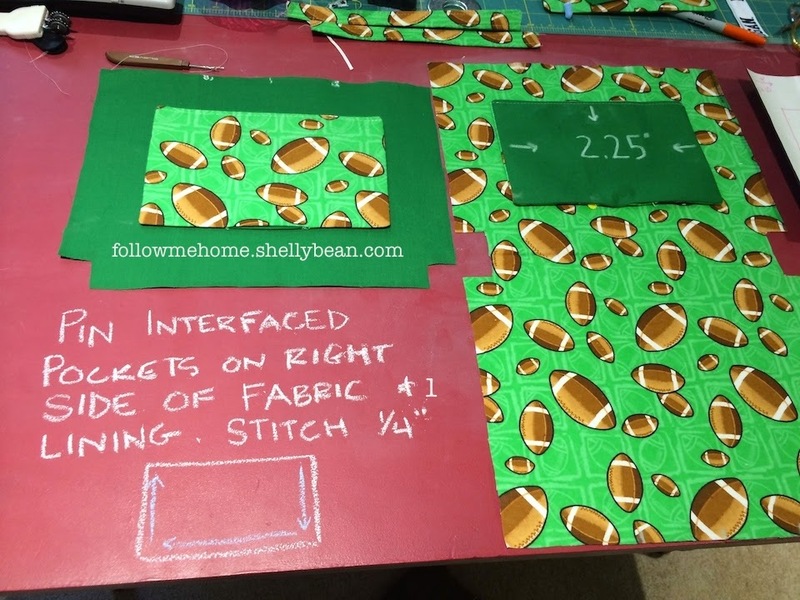 Leave me a message in the shellybean shop! Any questions? Leave a comment at the end of this post! I'm happy to help. Finished measurements of the blue bag (not handles) are 9" by 8.5"by 2"
green bag is 11.5" by 8.5"by 2.5"
The following directions are for the green bag. 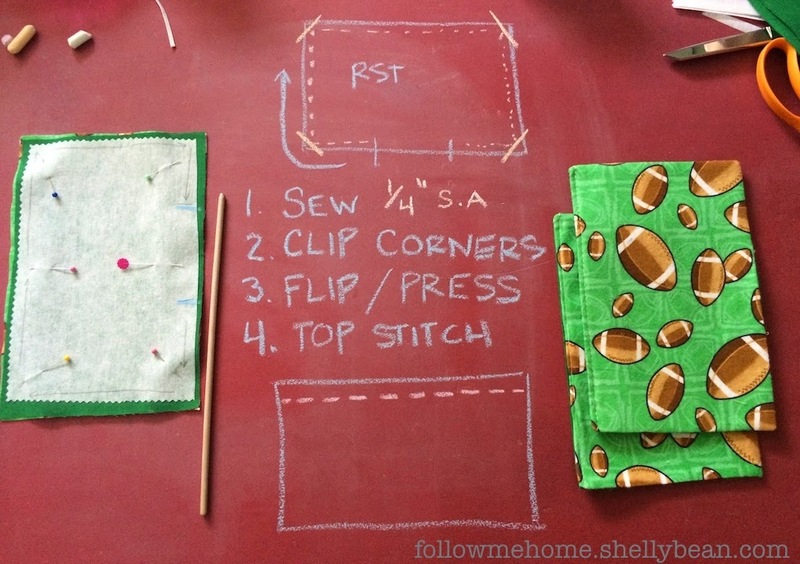 Sewing machine, sewing needle, scissors, pins, chalk, iron (set to fabric you're using). From experience: Do NOT fill bags with crayons if they are going to spend ANY time in a warm car. Little ones need to be careful of marker caps. Don't run with suckers in your mouth. You get it. Click on each picture to enlarge. Some photos contain detailed instructions/tips. 2. 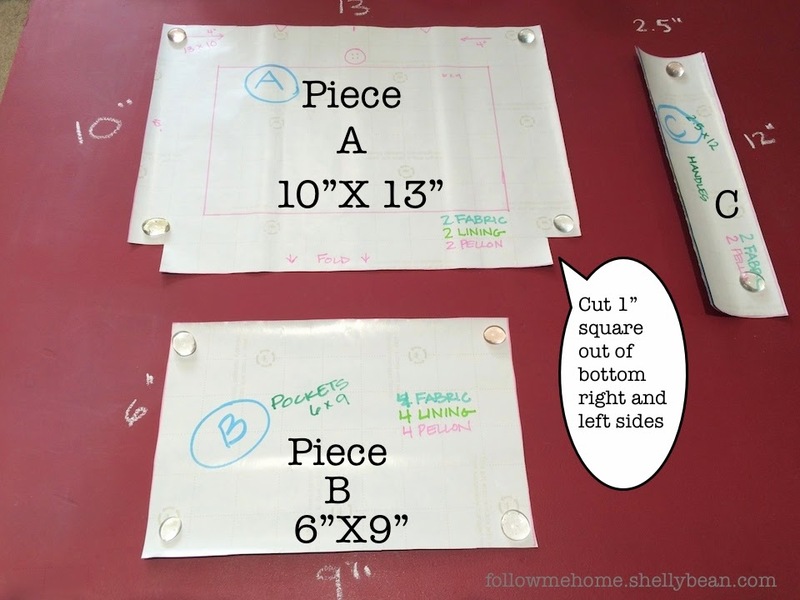 Cut out main fabric, lining and interfacing according to pattern pieces. 3. Press fabric and lining. 4. Iron on interfacing. You only need to interface TWO of the lining pockets; not all four. 5. Iron and sew handles. 6. Transfer handle and elastic markings. 7. Sew pockets. I used one main fabric and one lining fabric for each pocket. 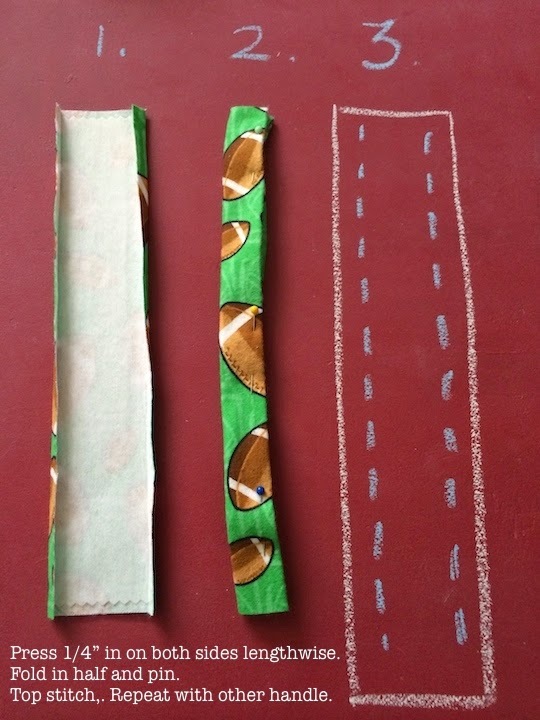 Two finished pockets will have interfacing. Two will not. 8. 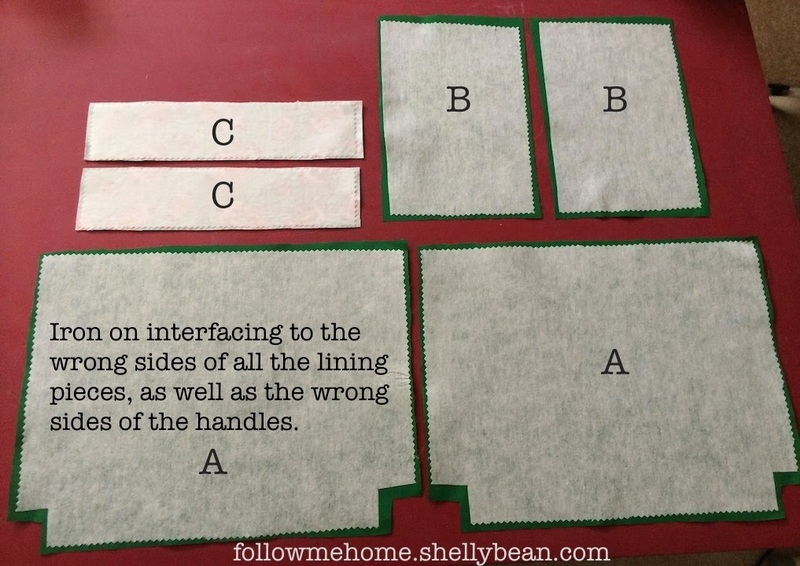 Pin/sew interfaced pockets following directions in the photo. 9. 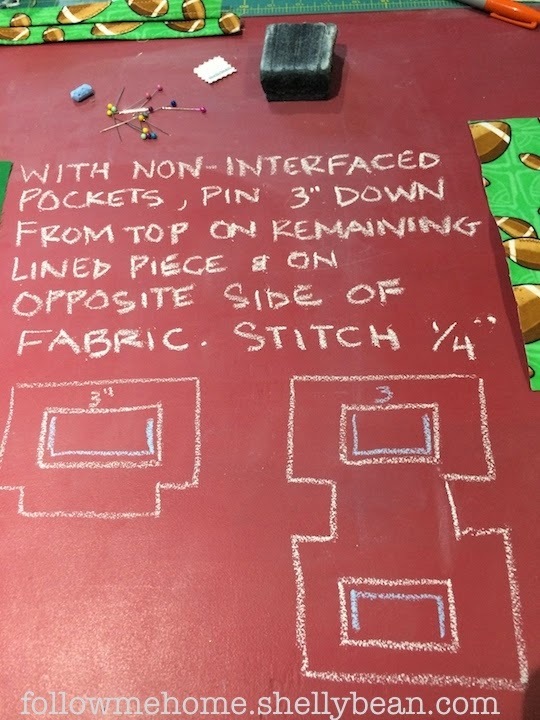 Pin and sew on non-interfaced pockets according to photo. 10. Measure, mark and top stitch divider pocket. 11. 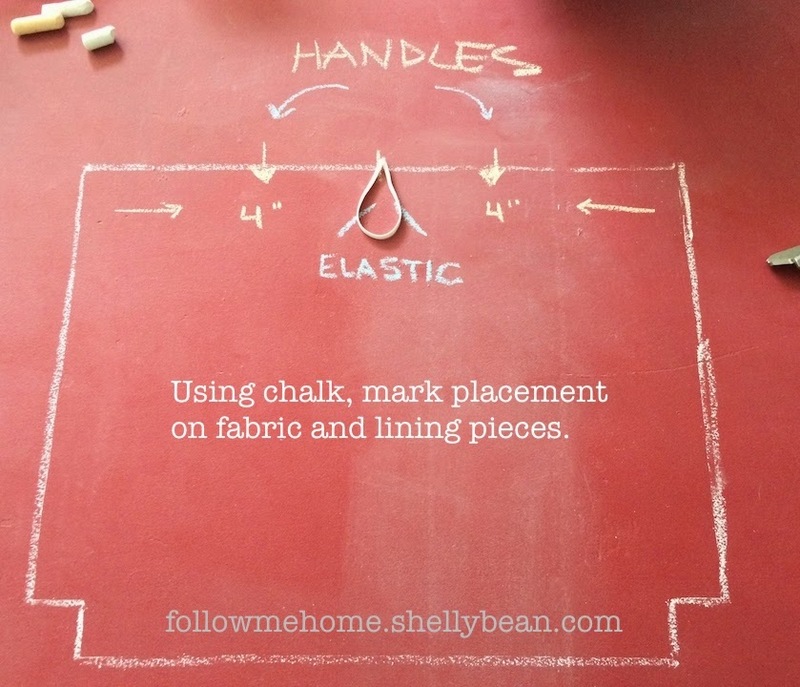 Pin handles and elastic at markings to main fabric. Baste or stitch close to edge. 12. 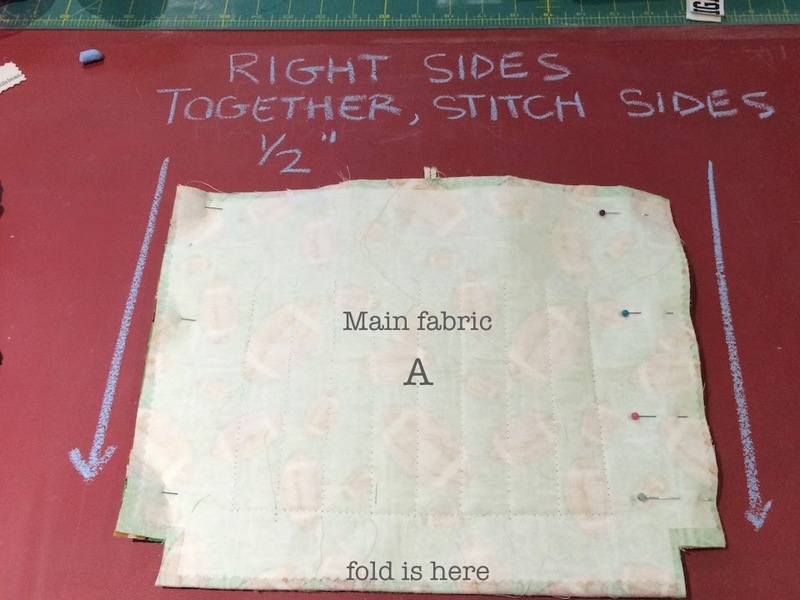 Using a 1/2 seam allowance, stitch sides. Press seams open. 13. Repeat with lining, but leave bottom open at markings. Leave about 4" open at bottom. 14. Box corners. 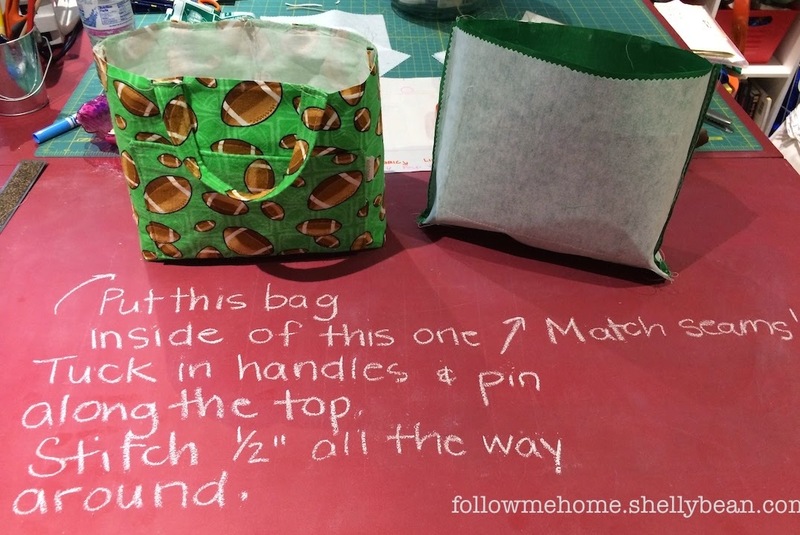 You're matching the bottom of the open side seam to the base of the bag seam. Pin. 1/2" seam allowance. 15. Put main bag into lining. Right sides of both bags will be facing each other. Match side seams and markings of tucked-in handles. Pin along the top. Stitch all the way around. 16. Remember that 4" opening you left in the bottom of the lining? Open that up and carefully pull the whole bag out. This will eventually pull the lining right side out too. You will tuck that into the bag so it becomes the "lining". You can slip-stitch the 4"hole closed. 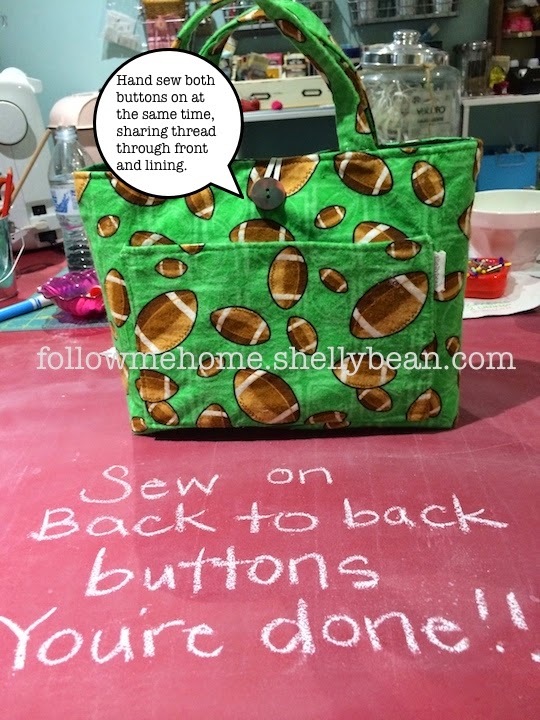 Now you can top-stitch the finished bag along the bag top. 17. 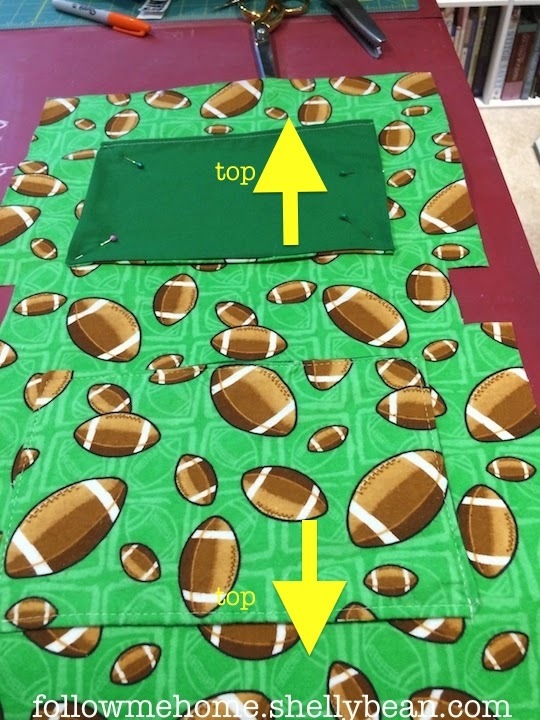 After you sew on buttons, you can decide which side you like best. Shown here is the bag right side out. Here is the bag "Lining" side out. Press bag if needed and load that baby up. I use markers on the inside and colored pencils on the outside. There's construction paper and stickers inside also. Here's one for my family's home team(s). And there you have it. Whew!! Don't forget to stop by the other sites participating in this virtual party. Remember, winners NEVER quit, so keep on reading! Each blog is really excited to have you visit! The hostess of this rocking tailgate party is none other than Karen, from "Baking in a Tornado". Pop over to see her fantastic recipe for an amazing Glazed Kielbasa Sandwich. Stacy, from "Stacy Sews and Schools" teaches us how to make her very cute Team Color Headband and Earmuffs. Robin, from "Someone Else’s Genius" gives us an analysis of college football in her Review of the book "The System: The Glory and Scandal of Big-Time College Football"
Diane, from "Canning and Cooking at Home" is showing us how to make a delicious Spicy Mustard Relish. 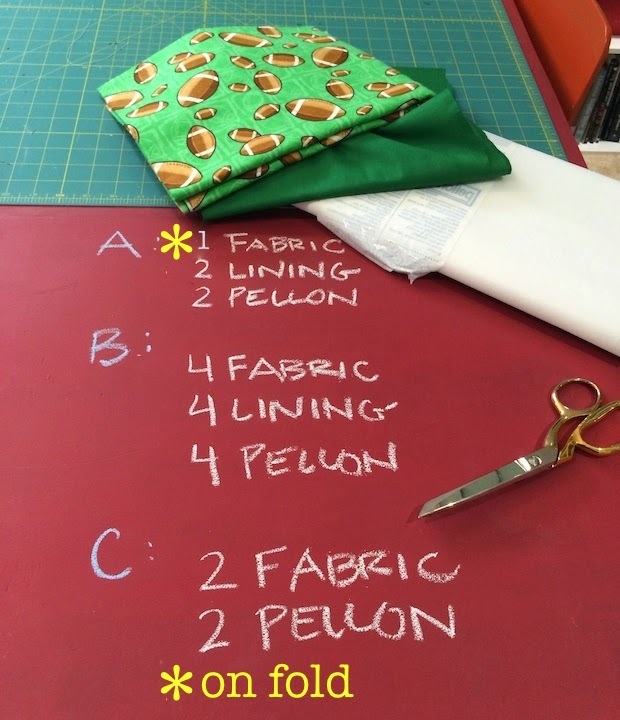 Eileen, from "Eileen’s Perpetually Busy" shows us how to make a tailgating Team Colors Seat Cushion With a built-in handle for carrying ease. Sweet! Lydia, from "Cluttered Genius", has an Easy DIY Upcycled Team Garland that shows you how to make a garland for your tailgating party out of products you already have in your house. Shawn, from "Literary Litter" provides a tutorial on how to make an adorable Snapcap. It's a crocheted hat that will keep you warm AND let everyone know what's on your mind. Melissa, from "Home on Deranged" brings technology to tailgating, showing us how to use technology and cool gadgets to ensure you are master of tailgating time! Haha! You know it. I had left over State fabric from a project I made for a friend. Always a Michigan fan (even though they're going through a learning year right now.). Love you right back. SO CUTE!!!!! I have to make these for the kids!!! I think that would make a cute and functional purse if I used the right fabric. However, I know my daughter could use one of these for trips. She loves to take all kinds of "busy work" with her for the car. They're fun to make (if you like to sew). Thanks, Diane! I know I'm not a kid but I could definitely see myself using one of these. I need all those compartments for my cr@p (I mean junk). 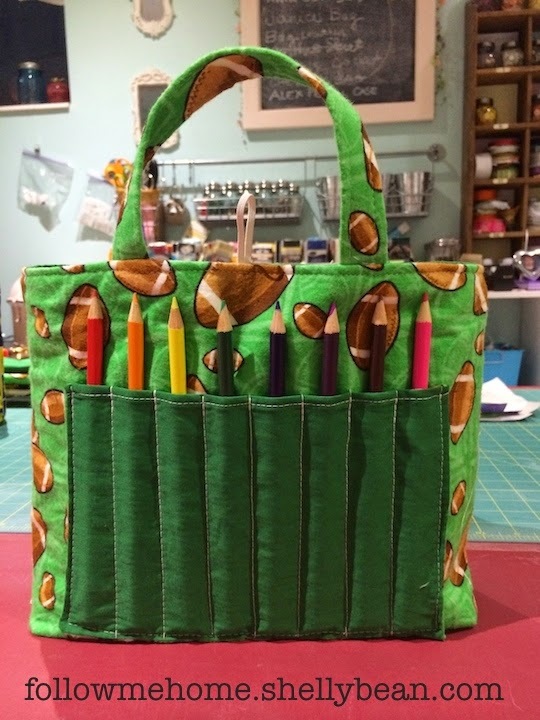 I just keep thinking that this would have made a great home-made diaper bag too, back in the day! I was thinking how effective it would have been to have when I was teaching. It's still nice to carry around all my suckers and candy bars in though....Haha! These things would be perfect for our everyday lives! I always try to bring coloring books to restaurants or long outings to keep the girls busy. And yes, I'm totally the mom who would buy it rather than make it! :) Thanks for sharing! Pinning! Love these ideas. Definitely going to have to try some of them. Take a photo. All of the bloggers would love to see what you come up with. These bags are adorable. I still wish I could sew more than a button. Love these cute bags so much! This tailgate party thing is awesome. 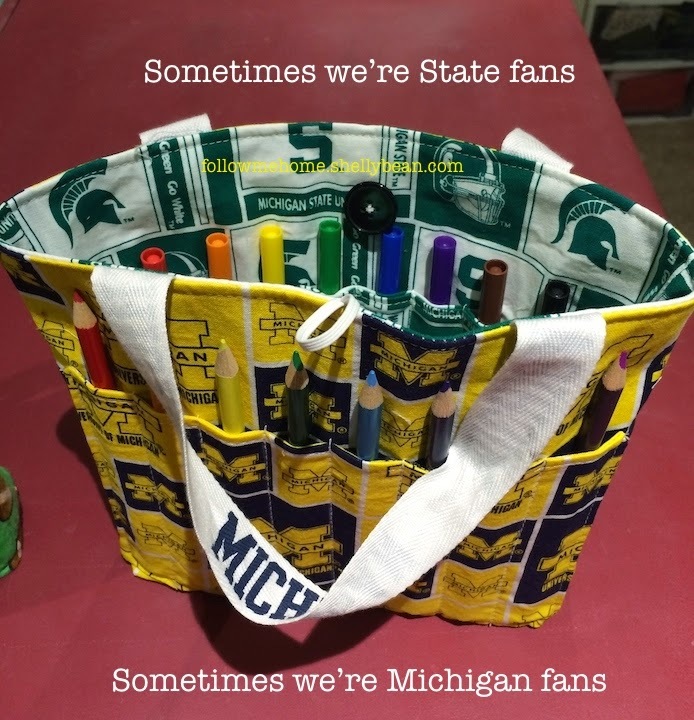 You all are so crafty :) I am anxiously awaiting a U of M bag for my own personal collection. ;) love you! I love your busy bags!! I wish I could so like that! Love these! AND the colors!! But, of course!